You remember those sliding puzzles back in elementary school that you would get in a goodie bag of candy and toys? It would be a picture of a snowman or something, and you would have to push the pieces to unscramble it. Well, those things were the sole inspiration for this game. Rooms: The Main Building takes this concept and expands on it. Sounds like a good idea, but unfortunately this game falls short in more than one way. I am reviewing the DS version, but I hear the Wii version is not too different. Essentially, the game is just a glorified sliding puzzle. The difference is you can only move the piece your character is standing on, and that you’re trying to fix the puzzle in a way where the character can pass through a door. The game also adds a fair share of twists to the experience along the way to make it not feel like the same thing over and over. There is the telephone that teleports you to the other room, dynamite to blow walls down, and mirrors that move the other mirrored room in the opposite direction, just to name a few. The game brags about a 100 different puzzles, and they’re all different enough to not feel repetitive. That’s the good thing about the game. 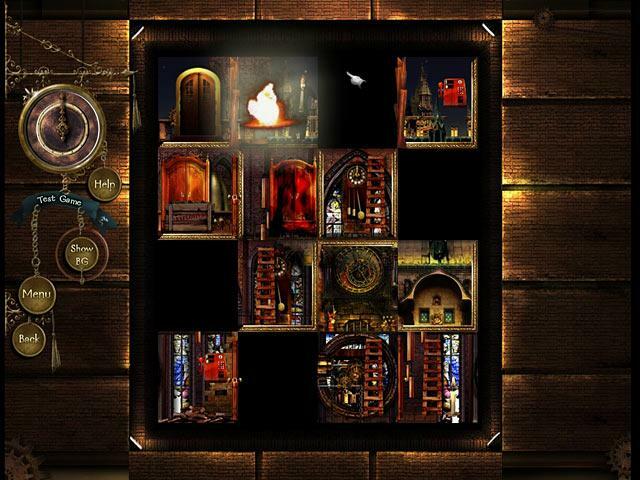 Eventually, the more difficult puzzles are completed by pulling off good timing as well. For example, you need to light the dynamite and run to the other room before you get blown up. The pinnacle of fun begins when they throw everything at you and you really get a sense of accomplishment when you pull it off. However, this challenge arrives way too late in the game, where I’m way too tired from the mindlessly easy puzzles. The sound in this game consists of some groans and grunts, along with the same looped track over and over. I do not care how good any piece of music can be (not saying that the music is good), hearing anything looped leaves a bad taste in your ears. 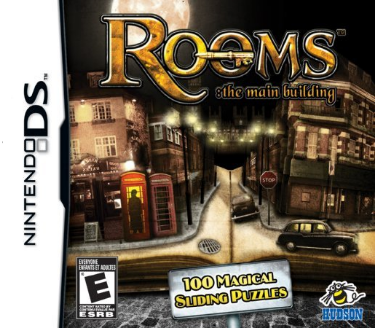 Rooms really suffers from bad controls and graphics. The whole game is stylus driven, so there is absolutely nothing done with the buttons. That said, I found myself tapping the wrong place on numerous occasions. 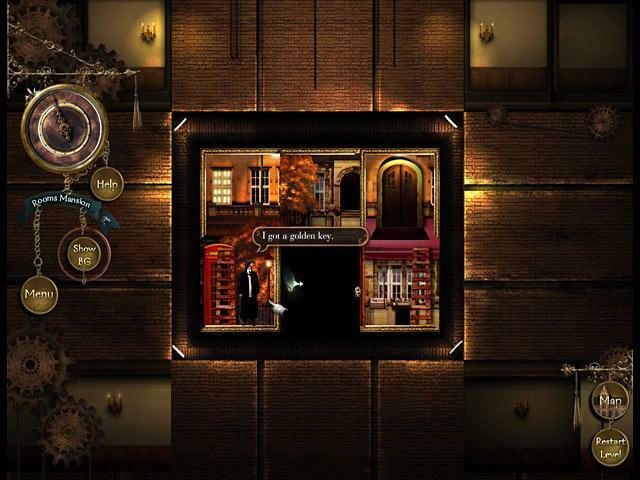 The rooms are so tiny, it is very easy to accidentally tap the wrong object or direction. I have even made the mistake of restarting a puzzle, because the options are very close to the edge of the rooms. This happens so easily, because when you tap restart there isn’t even an ‘Are you sure you want to do this?’ that pops up, it instantly restarts. It’s frustrating, because this is constant. I figured I would eventually get better at the controls, but it’s just a classic case of poor design. The graphics and presentation are horrendous. Brown ladders blend in with the brown doors. The brown closets blend in with the brown crates. The whole game looks like an ugly brown mess. For the first few puzzles I was stumped, because I couldn’t spot the objects that blend in with the background. My eyes eventually adjusted to the game’s lack of clearly visible objects, but why did it have to? I’m not a graphics junkie, but I say ‘if I can see what I am doing, the graphics are fine.’ That wasn’t the case with Rooms. Oh and the story? It seems as though they threw in a random story just to tie all the puzzles together. It’s a waste of time. I suggest going to the options and selecting the fastest text speed to skip all the talking parts as quickly as possible. The main game finished in about 5 hours. I didn’t complete every puzzle, I did what had to be done to complete the game, and depending on how dumb you are (sorry, it’s the truth though) it may take a bit longer. I say it is entertaining for those who like good thinking challenges (I’m talking to all you Sudoku puzzlers), but for its price and length, this game is very passable. I enjoyed it, but it may not be for everyone. Could I have lived without it? Definitely.